It's officially the 13th of the month and the day that Spooky Time Jingles updates their website with new, one of a kind collectibles from a variety of talented holiday artists. I was asked to be their surprise feature guest artist for their one year anniversary which is today! So, that means you can peek in and see what I am offering! 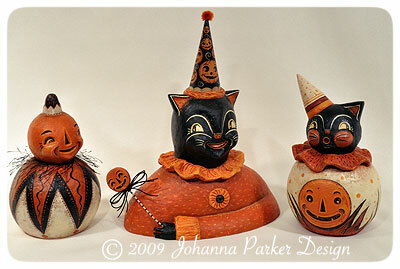 I created 3 special original Halloween pieces, each benefiting the ASPCA in their efforts for animal rights. So, if you purchase from me, a portion of the sale will go to help animals in your name! CLICK HERE to visit my Guest Artist page to see what's up for adoption, and THANK YOU! 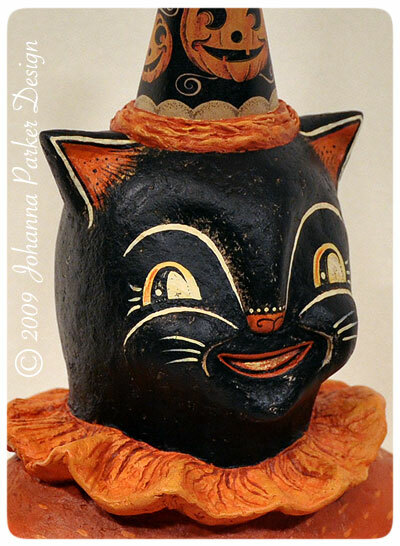 * "Ziggy", "Witty-Boo Kitty" and "Jackalin".... all one of kind originals up for adoption..
* © 2009 Johanna Parker Design * Halloween folk art images are the property of Johanna Parker and may not be used without permission.